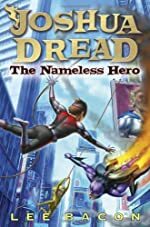 Joshua Dread: The Nameless Hero by Lee Bacon. A Joshua Dread Book. Review: How does it feel to be famous superhero? Can things too out of hand? Lee Bacon's genius book, Joshua Dread: The Nameless Hero starts off with Joshua receiving an invitation to Gyfted & Talented, a mysterious program for children with superpowers. Joshua's entire summer plan is turned upside down as he goes through training to help him prepare for the battle against the man who wouldn't want anything more than to have Joshua dead. That man is Phineas Vex, who is thought to have been dead. As he prepares for battle, Joshua and his friends Sophie and Milton get more than they bargained for as they discover the secrets behind Gyfted & Talented. When I picked up Joshua Dread: The Nameless Hero, I expected another one of those stereotypical superhero stories. I was VERY wrong. Joshua, the main character, doesn't even know he possesses superpowers or a 'gyft'. Both of his parents are super villains, which makes his life even more bewildering and comedic because most of their inventions horribly fail. Also, I love that every chapter ends in suspense, though some chapters may have tried a little too hard in order to create suspense. Joshua Dread is the perfect book for boys ages 9-13 because it has a lot of action packed scenes involving super heroes. This book starts off with every character seeming like they have a secret, but as you read you learn more and more about them, readers may even feel a connection with them. I don't want to give anything away for the readers planning on reading this book, but I wasn't expecting that plot twist at the end. Now I'm stuck impatiently waiting for the next bookÉ if there is one. We would like to thank Random House for providing a copy of Joshua Dread: The Nameless Hero for this review. Have you read Joshua Dread: The Nameless Hero? How would you rate it?